As children grow, they develop a myriad of skills and abilities over time, and one of the most important is their fine motor skills. Fine motor skills are what allow children to make small ("fine") movements with extremities (fingers and toes) and other parts of the body like the hands, tongue, lips, wrists, and feet. Children use motor skills to make small movements, like grasping something with their fingers or making a pucker face with lips. Fine motor skills develop gradually, and they can develop at different times for different children. Most doctors begin to check for fine motor skills in children at their 2-month appointment, and skills continue to develop steadily until ages 3 or 4. However, for some children, the development of fine motor skills can be delayed, and can require some extra work and practice to meet the level of their peers. Parents who are worried about a child's fine motor skills and want to help him or her make progress in their development can check out the information below for some helpful tips. There are many signs of fine motor delay in children that parents should watch out for. Children with fine motor delay do not show interest in grasping objects. They often have poor hand-eye coordination, and they can appear to be rather clumsy. For children who are old enough to go to school, fine motor delay can be manifested by a love for the playground and physical activities, but an avoidance of quiet, table activities like drawing, writing, or even eating meals with a utensil. Children with fine motor delay have trouble doing things with their hands that other children normally enjoy, like building with blocks, scribbling on paper, or even sticking their tongue out to taste food. Parents of children showing signs of a fine motor delay should not fear for their child! In reality, there are many things parents can do to help their children develop to the level of their peers. One good strategy is to incorporate fine motor exercises into a daily routine -- and to make them fun! Parents should try to set aside at least one window of time every day to help their child use their fine motor skills, whether it's first thing in the morning, after school, or right before bed. Rather than have children sit at a table and draw with crayons, parents should do something active with them like kneading Play-Doh, spray-painting poster boards with spray bottles, or mixing cookie dough with spoons (to then bake and eat!). Additionally, to aid in the development of writing skills, parents can set up an easel with markers and crayons, since writing vertically has been shown to build the muscles necessary for fine motor skills more efficiently than writing on a flat surface. For more tips, check out our Pinterest Board full of activities to strengthen fine motor skills. If your child has poor fine motor skills , we invite you to consider The Brain Balance Program. 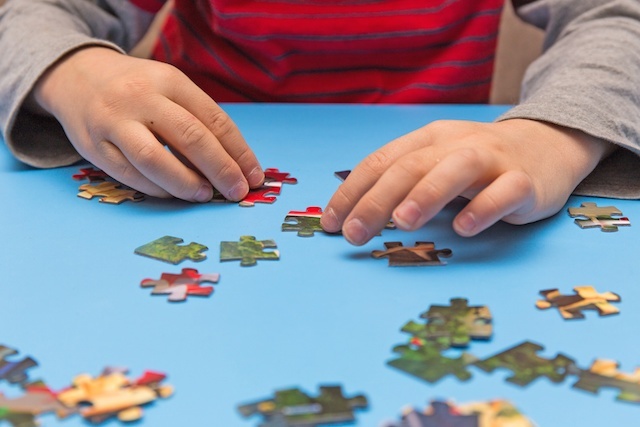 Children with learning disorders may have missed significant developmental milestones, which can be a contributing factor in their struggles. Our unique integrated approach helps your child achieve optimum body and brain function, which supports improved learning—academically, socially, and emotionally. You’ll be amazed at the physical and academic advances your child will make during our program. Contact us today to learn more!